After several hats in a row, I wondered what to do next. Then I found the Patonyle sock wool I had bought a few weeks ago and not added to the sock wool hoard. Ysolda Teague's Veyla fingerless gloves has been on my wishlist for quite a while , so I bought and downloaded her Whimsical Little Knits 2 and printed off the pattern. I have an old pair of fingerless mitts which have seen a lot of use and my kid gloves are years and years old and are showing sad signs of wear. Fingerling weight yarn was suggested so I chose the deep green which matches my silk jacket well. 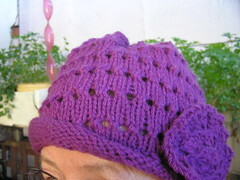 I knit loosely so went to 3 mm needles instead of the 3.25 mm suggested and I made the bigger size. My hands are average size, perhaps a bit smaller, and the larger needles would have been better. These fit but I think either next size up needles or perhaps a truer fingerling weight than Patonyle sock wool would have been better. 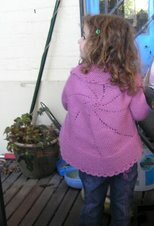 The picture shows them hot off the needles, unblocked. I have quite a bit of 50/50 silk/merino from Knitabulous and may make another pair from some of that. I think it's a bit thicker than the sock wool. They were a quick knit and quite easy but a bit fiddly as my 3 mm dpns are longer than the smaller sock needles I usually use. The thumb was particularly awkward with just 21 stitches to work around. I found the buttons in the stash my friend gave me from his dressmaker mum who died over ten years ago. They were still on the card and the number was just right. I usually find a I have a couple left over or there are not quite enough on the card and there's only one card. I think they suit. The weather has been incredible up here. Bitterly cold yesterday with snow just west of Sydney. Then torrential rain and strong wind overnight and more rain this morning. I saw a photo of the surf at Bondi this morning and it was very rough indeed. Minutes after I took this photo the sky clouded over again and down it poured. There were three of these cockatoos when I went to photograph the gloves but one flew off. I couldn't make out what they were gnawing on but it was actually in the gutter and kept falling back into it. They would combine their effort and pull it upright again for another chew. * Song about kid gloves is here. I love Ysolda's patterns too. Your gloves look very pretty and I am sure they would look lovely in Knitabulous' yarn too. We have had the cold but not much rain yet. Those gloves have a pretty cuff. My MIL (aged 77) drove home to Sydney from Canberra yesterday - she drove through snow near Mittagong. Your fingerless mittens look beautiful, of course I love the colour, but the pattern is so nice. Very good buttons!! Those cockatoos are very funny, and determined!! It has been icy and windy here, but not as bad as where you are: rung up!! !